We have had the opportunity to meet with Aby Rosen, his RFR staff and their attorneys at Kramer Levin regarding the pending Landmark application for 11 Bond St. that will be heard at CB#2 Tuesday, 1/19 at 6:30 pm, 32 Waverly Place, Rm 401. The building was erected in 1913 as an animal hospital by New York Women’s League for Animals. The current entrance on the south side is ramped to the second story for the horses that used to be treated there. In 1924 the League constructed the half penthouse on the south side. In 1965 it was converted to a factory and offices. The next conversion to the Women’s Shelter occurred sometime in the 1970s. Its fourth evolution will be as a single tenant retail location. RFR has had extensive talks with and recommendations from Landmarks regarding the restoration and retrofit of this building. Landmarks has recommended the completion of the roof-top penthouse across the full length of the building. Landmarks staff has also approved of the conversion of what are now small squarish windows designed for a horse-eye view to full size windows matching the remainder of the building. The new first floor of the building will begin at street level and extend to the ceiling of the current above-grade first floor with an elevator and stairwell at the location of what is now a two-story ramp. This reconfiguration will also accommodate handicapped access. You can see a larger version of the rendering and floorplans at the RFR site. Why a single retail tenant? The lot is extremely narrow making access for multiple entities (along with multiple emergency exits) very difficult if not financially unfeasible for the amount of remaining core space. We have also been informed that accommodating a food and beverage establishment is equally problematic especially for the required venting and emergency exiting. Mr. Rosen and his team feel that a single retail tenant would be most attracted to the retail and office use of the approx 15,000 sq. ft as well as to NoHo’s Lafayette St. corridor. The architect for the project is Annabelle Selldorf whose just completed 10 Bond St. is reportedly now fully sold of their 11 units. 10 Bond Street has been developed by a collaboration between SK Development, Ironstate Development, and The Chetrit Group. There will be meetings between RFR and the Co-Op owners at 7-9 Bond St. regarding aspects of construction and roof-top configurations in preparation for the Board of Standards and Appeals Application for a change of use from a Community Facility to a Retail use. 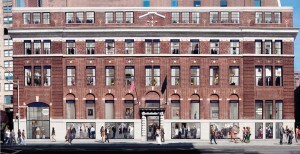 It is anticipated that NoHo-Bowery Stakeholders, Inc. will approve of the Landmark application.